Cleveland Clinic has announced the formation of its new Center for Therapeutics Discovery, led by medicinal chemist Shaun Stauffer, PhD. The goal of the new center is to bridge the gap between translational research and clinical drug trials, which will accelerate discoveries to advance clinical care. Dr. Stauffer's vision for the Cleveland Clinic center is to identify promising projects, remove risks and barriers to creating new therapeutics and form industry partnerships. He plans to create three cores: a medicinal chemistry/synthesis core, screening/target validation core, and drug metabolism pharmacokinetics core. His group will also employ computational and structural biology tools within the center to advance programs when and where appropriate. Once fully staffed, the center will be one of the largest of its kind in northeast Ohio and will become a hub of treatment-focused research in the area. "We are thrilled to be entering this next phase of drug discovery, which will not only help advance life-saving research but attract new business partnerships to Cleveland," said Serpil Erzurum, MD, Chair of the Lerner Research Institute, where the center will be housed. "I am excited to help educate Cleveland Clinic researchers and physicians about the drug discovery process, and to help expedite the translation of basic research to cures for our patients," Dr. Stauffer added. 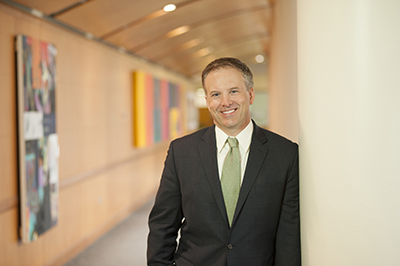 Dr. Stauffer came to Cleveland Clinic from Vanderbilt University, where he helped build successful drug discovery teams and worked on both collaborative industry projects and federally funded studies. Prior to Vanderbilt, he worked in several therapeutic areas at Merck & Co., including development of cardiovascular, pain and Alzheimer's drug candidates, one of which reached Phase III clinical trials. Dr. Stauffer holds a PhD in organic chemistry from the University of Illinois and completed postdoctoral training at Yale University.